As many of our regular guests know we have four shire horses grazing Bosinver meadows during the summer months. They belong to a neighbouring farmer, Alfie Trethewey and are lovingly cared for by him and Briony Gill. Alfie and Bri have won many awards and competitions with these gentle giants and we just love having them around. 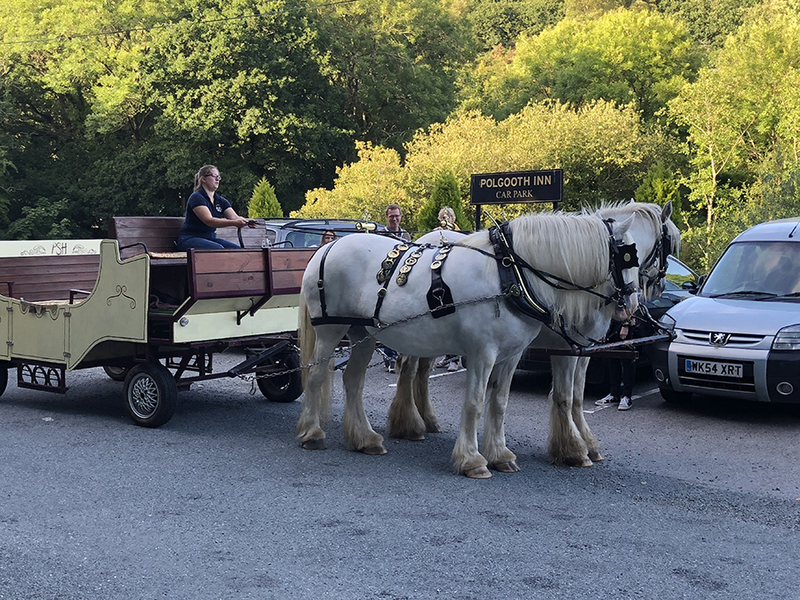 We recently had some friends staying from the USA and knowing how they love our English traditions, we booked a carriage ride to our local pub for a special surprise treat for them. 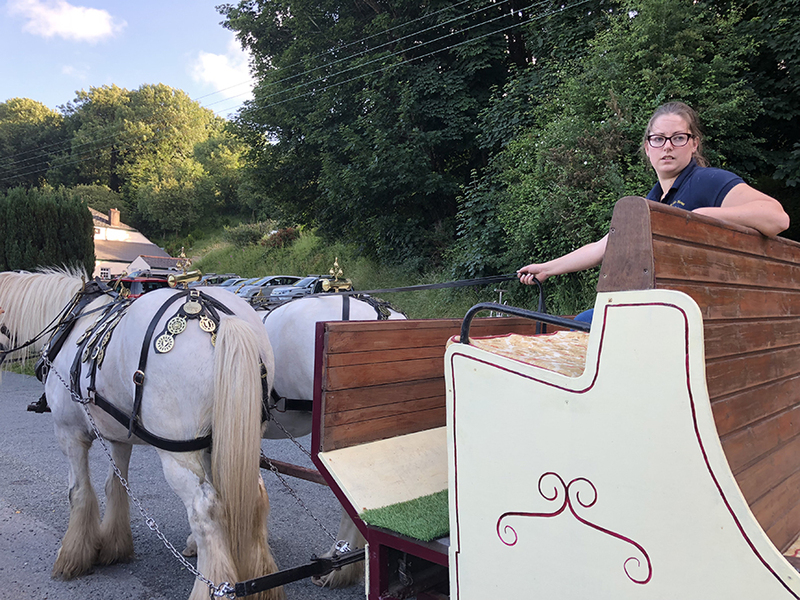 The day before Alfie came over and washed and shampooed Angel and Ladd and on the day, he and Bryony spent hours polishing the brasses on the harness and making sure everything was looking its best. They pulled up at the Farmhouse and our friends couldn’t believe their eyes! Everything looked spectacular and we felt like royalty as we climbed aboard and set off at a walking pace up the drive, heading for the pub. 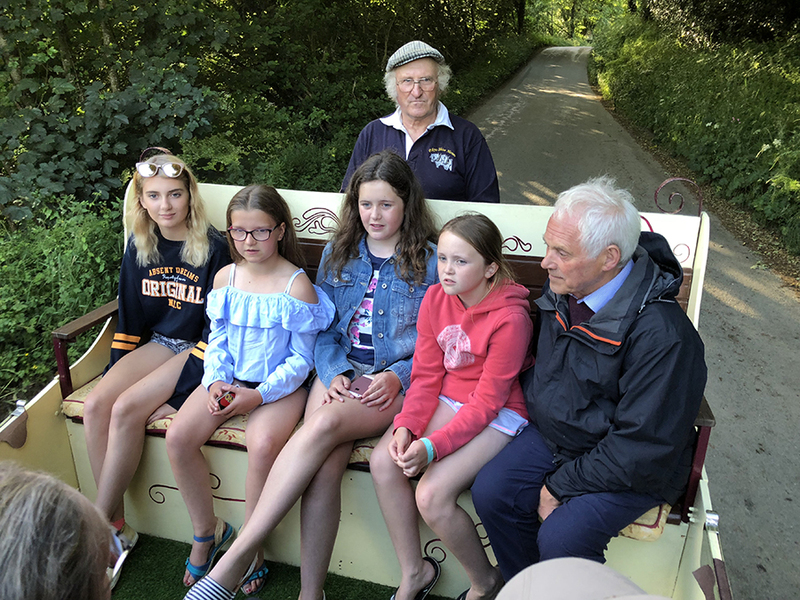 We followed the road up to Trelowth and down through Polgooth village, obviously slowing up the following traffic but people were very gracious and I think they were enjoying seeing the beautiful horses. I was practicing my royal wave to passers by and thoroughly enjoying life in the slow lane. 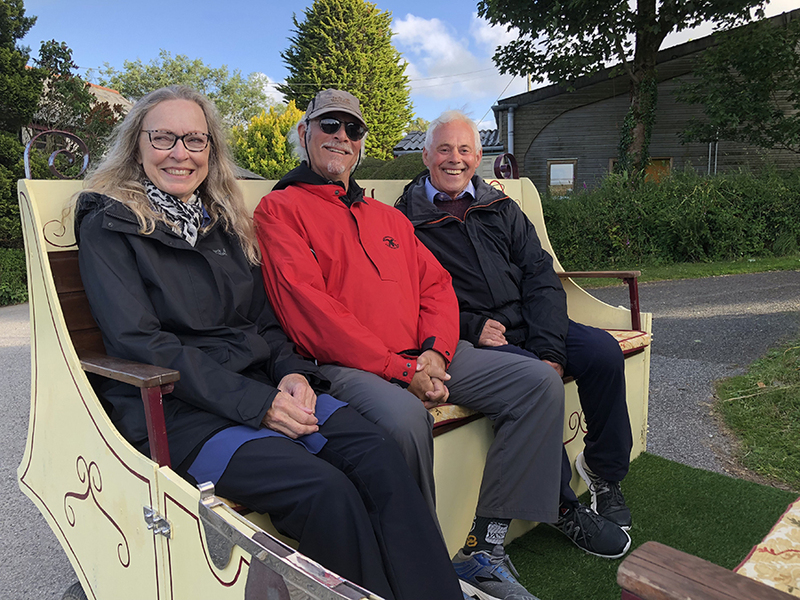 It made me realise just how long it would have taken people to journey from place to place when horse and carriage was the only transport available – 5 uncomfortable days to London! When we arrived at the pub we had several volunteers for a ride and another circuit was made around Little Polgooth. Refreshments arrived for men and beasts courtesy of Alex and Tanya, hosts of the Polgooth inn, now official holders of the trophy for Licensees of the the Year Award from the British Innkeepers Association. We are so lucky to gave this great local pub on our doorstep. 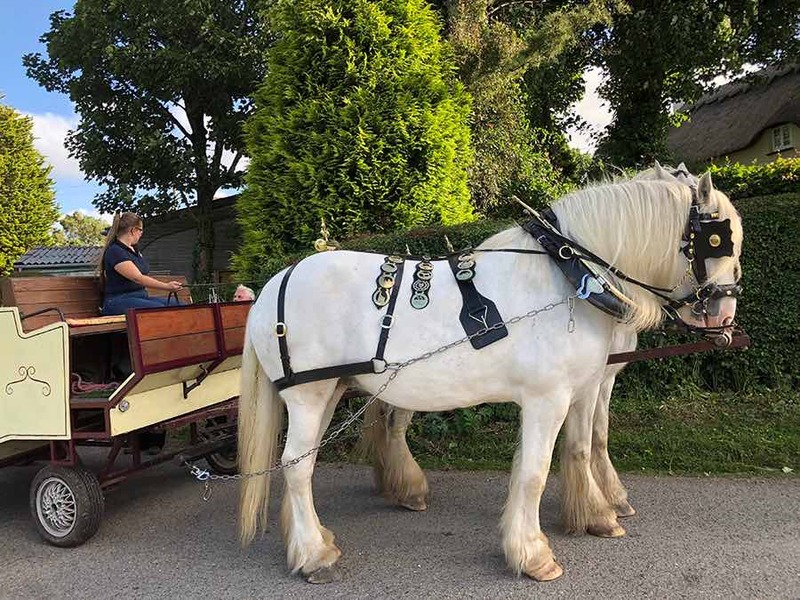 If you would like to know more about booking a holiday here at Bosinver, please email reception@bosinver.co.uk or call 01726 72128, and please contact us if you would like to enjoy a horse and carriage trip while you are here.